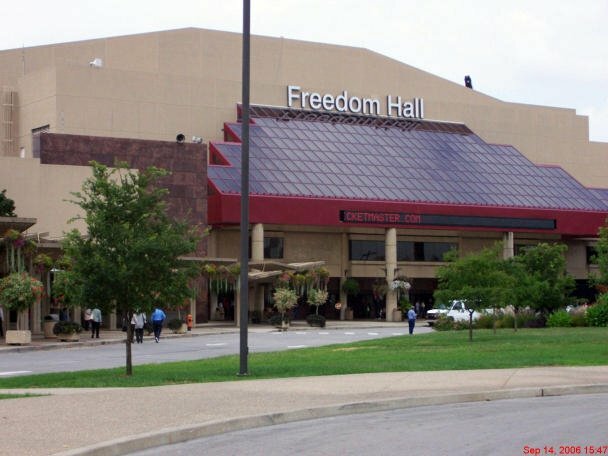 Freedom Hall was completed in 1956 as part of the newly opened Kentucky Fair and Exposition Center. During these early years, several of the biggest musicians around performed at Freedom Hall, including Elvis, Ray Charles, Jackson 5, Elton John, the Rolling Stones, Kiss, Johnny Cash and the Beach Boys. It was the full-time home of Cardinal men’s basketball from the 1957-58 season to 2010, with the team winning 82% of home games in 50+ seasons, and until the early 1970’s, Freedom Hall was the biggest home arena in the US. The late, great Muhammad Ali fought his first professional fight at Freedom Hall when he won a six-round decision over Tunney Hunsaker. Twenty-eight years after the completion of Freedom Hall, in 1984, the venue underwent a $12.5 million renovation, which brought with it a new concrete floor ten feet below the original and added seating, which brought the arena capacity to 19,500. Other upgrades included new lighting, new meeting and dressing rooms, new scoreboards and a new exterior glass facade.